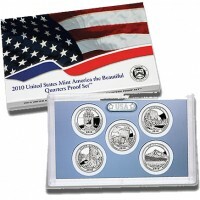 The 2010 United States Mint America the Beautiful Quarters Proof Set™ marks the first proof set to include only the strikes of the America the Beautiful Quarters Program which debuted in 2010. The America the Beautiful Quarters Program features five coins a year with reverse designs emblematic of selected sites found throughout the United States and its territories. A total of fifty-six new strikes will be created under the program which is scheduled to end in 2021. This set included the first five quarters of the program, each struck to proof quality which results in a coin with enhanced detail and a mirror-like background. The coin release order for the program is dictated by the order in which the selected site came under the direct control of the federal government. The five proof quality quarters in the set are enclosed by a protective lens to protect each coins finish. The lens is then shipped in an illustrated cardboard box. 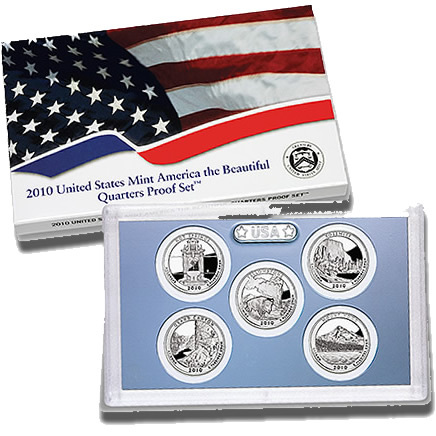 The US Mint released the 2010 Quarters Proof Set on May 13, 2010. The issue price on each Proof Set was $14.95. Each coin in the set was struck at the US Mint’s facility in San Francisco. First appearing on the quarter dollar in 1932, John Flanagan’s portrait of George Washington was used for the basic design found on the obverse (heads side) of each quarter. The design was slightly modified by William Cousins.